Lightweight design makes it easy to transport! Non-glare lenses ensure message is readable from all angles! Standard 17" x 11" size can be printed right off many business printers! Black expanded PVC backboard supports posters, or vinyl letters applied at local sign shops! 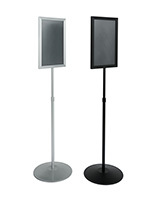 This metal sign frame is designed to direct patrons in business lobbies, restaurants and more. 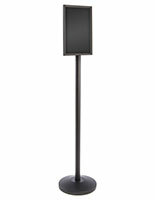 A poster holder, also known as a menu stand, can be used by retail stores to communicate sales or clearance events. Restaurants will find this metal sign frame perfect for displaying a message such as 'Please Wait to Be Seated' or 'Pick-Up Orders Here'. 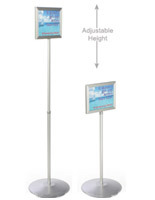 Each advertisement stand could also be used in schools, museums, and more. 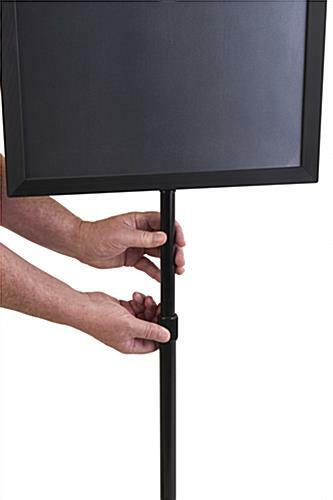 This economically priced metal sign frame is ideal for communicating virtually anything to customers or patrons. The tall slender design allows this unit to be placed in a busy entryway without getting in the way of foot traffic. This metal sign frame is lightweight and portable, so it is easy to move from one place to another as such needs arise. 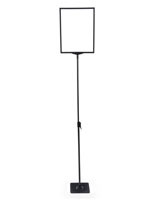 This poster stand is a relatively inexpensive means of promoting products and services in practically any type of commercial setting. 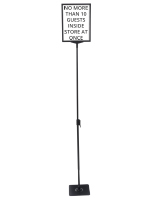 This sign holder, metal sign frame is constructed from black powder coated aluminum. 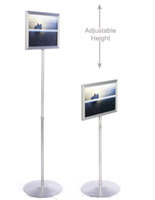 The stand features a telescoping pole, so users can adjust the framing height between 40"h and 63"h. This poster holder accepts up to (2) 17" wide by 11" high messages in its double-sided framing. To assemble, simply place a sign between the black expanded PVC backer and the non-glare plastic lens (repeat on opposite side, if necessary) and slide in the top channel of the metal sign frame. To further save you money, many business printers are capable of printing 17" x 11" advertisements right in an office; no need to have a small run done at a sign shop. However, another great feature of this metal sign frame is the ability of the black expanded PVC backer to have vinyl letters applied at a local sign shop, to create a more permanent message. This unit ships unassembled. This metal sign frame includes all of the necessary hardware and instructions for a quick, one person assembly. Please Note: Although this is an 17" x 11" sign frame, please allow 1/2" on each side of your poster or advertisement to be covered by the metal frame. Frame channel does not accept any materials thicker than standard poster material. It was easy to assemble and insert a sign. The product materials were of high quality which made for a sturdy stand. The only thing I couldn't find was a case to transport or store it. Tamela, thank you so much for the wonderful review! We take pride in the quality of our products, and we're so happy that you found this sign stand to be sturdy and easy-to-use. Its lightweight design makes it easily portable, however, we understand that a travel case may be helpful for travel and storage. Unassembled, this sign stand ships in a 16" x 28" x 5" box, so this sign stand would fit in a case with those dimensions or greater. We'll certainly send your feedback along to our product development team. 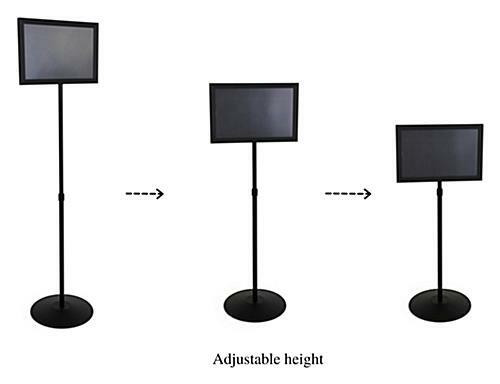 In the meantime, you may be interested in one of our customizable hard shell cases with pick-and-pluck foam inserts that you could use to store this sign stand and your other displays. Because these fit 11x17 paper which is available in our copiers, it is EASY to make professional looking (not handwritten) signs for our buildings/events. 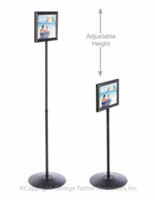 Very easy to use and since the height is adjustable, works in many spaces. We keep SEVERAL of these on hand at all times. We're so glad to hear these signs work so well for your needs, Diane! Thank you so much for shopping with us and letting us know what you thought. I purchased this signage for a grand opening to provide directions for tour groups in places where there wasn't a wall or doorway nearby to attach a sign to. The 11x17 size allows for you to increase the size of the printing to be read at a distance. I assembled it in less than 5 minutes. I would recommend this product. I have ordered this item several times. Great product at a great price and fast delivery. Always satisfied. Easy to put together, sturdy, and price was good! We're so glad to hear it, Deb! Thanks for shopping with us and taking time to review -- we appreciate it!